Thousands of people are in need of your prayers as incessant rains hit three South Asian countries. While many areas on the globe are experiencing a tremendous drought, a torrential downpour has made its way to Northern India, Myanmar (Burma) and Bangladesh. The unwelcome rains have left thousands of people homeless and in need of help. Gospel for Asia is providing as much assistance as it can to those suffering from the downpour. Four states in India are battling against floods. In Assam, India, two primary national highways considered “lifelines” collapsed after three to four days of continuous rain. In one of the worst hit areas of Assam, helicopters were sent out to rescue marooned people. In the West Bengal islands, rain has weakened several river embankments. Reports indicate that about 2,500 houses have been damaged by the flood waters. Bihar, India, has about 500 houses that have been affected. Out of those 500 houses, a GFA field correspondent reports that 90 of those were homes of Bridge of Hope children, and another 20 belonged to believers of a local GFA-supported congregation. Thankfully, the church building and the Bridge of Hope centers in the flooded areas were not destroyed by the rising water. In Jammu and Kashmir, India, houses and other structures are collapsing, killing a number of people and injuring others. Landslides are also a problem, washing off stretches of road and obstructing villages. In the country of Myanmar (Burma), villagers had to desert their houses to escape the rising waters. A GFA field correspondent reported that local missionaries serving in this country are not able to reach many villages because of collapsed bridges. 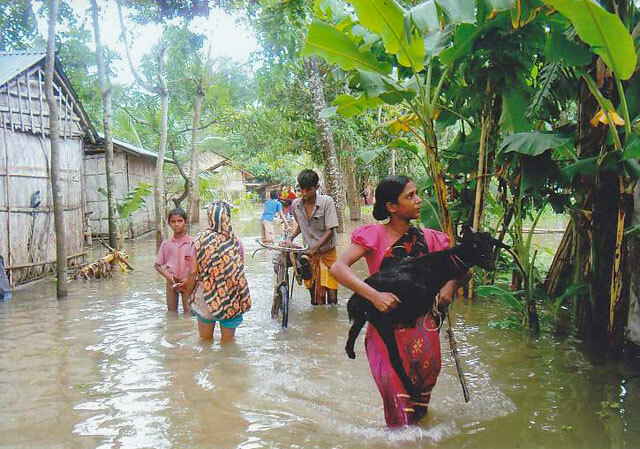 In Bangladesh, steady rain washed away houses, cows, goats, rice paddy fields and other crops. Out of the thousands affected, 238 families belong to seven GFA-supported churches in the surrounding area. GFA Compassion Services teams are making their way into villages, government-run refugee camps and school buildings temporarily housing people in desperate need of help. They are distributing biscuits, rice, milk powder, salt and other food items. Some areas are still too difficult to reach, but GFA Compassion Services teams will persist until they are able to provide help to all who are suffering. Please pray the relief teams will reach the people in time and help save them from starvation. Pray GFA-supported missionaries are able to share the love of Christ as they minister to those who have lost so much. Pray for the flood victims to experience the Lord’s comfort during this difficult time. Pray the rain will subside so restoration and reconstruction can begin. Thank you for interceding for them during this time.